The starting point for building your own home project,.. regardless of the approach you decide to take in building your house,..will always start with the same key things. This is true whether you decided to build your home yourself or have a contractor build it for you.. or maybe you like the manufactured home approach... Never the less the starting point will be the same. There are a few things however,.. that are much like that old aged question..”what comes first the chicken or the egg?”...and that is whether to pick your plan first.. or your building lot.. There are no right or wrong answers to this question. 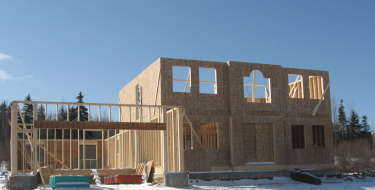 You may have a house plan in mind that fits your life style to a.."T"..or maybe you acquired a home building lot first. The pros and cons of each of these,..I will cover later on. Later on I will cover the steps to constructing a house, but for now the home building links I have posted below is a good place to start.